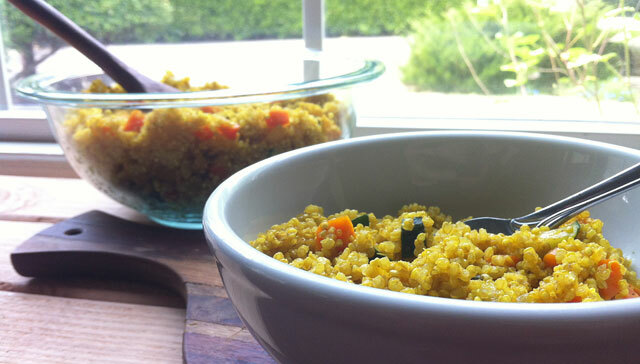 As far as the veggies in the quinoa, you are welcome to use what you have on hand. Snap peas, or green beans would be great! Or try some supper fine sliced cabbage. I also made plenty of quinoa for leftovers for the week. So if you’re not into leftover quinoa, cut the recipe in half. Side Note: I usually don’t serve inedible garnishes or parts of veggies, but I thought the stem looked very pretty on this dish, so I kept it. Plus it was a great tool to use to turn the peppers while grilling. Tips for Cooking Quinoa: Just like rice, add liquid, salt, and spices if using. Simply cover and leave it alone, don’t stir it, don’t check on it, leave it alone for at least 10 minutes, then you can lift the lid, add stuff and fluff. Always use a fork or chopsticks to fluff it. That’s about it. If you have questions, let me know below! 1. Drizzle a couple tbsp of oil into a medium sauce pot over medium heat, add the onions. Sweat on medium low heat for about 15 minutes to get all the sweetness out. Some color is ok here, but no burn, keep the heat low. Add the quinoa and stock/water, 1 tsp salt, 1 tsp turmeric, pinch cumin. 2. Bring the stock/water to a boil, then reduce to a simmer, cover and cook over medium low heat for 15 minutes. Check the seasoning after 10 minutes, does it need more salt? If so, add a small pinch here and a little black pepper. At 10 minutes add the veggies, carrots and zucchini. Incorporate by fluffing with a fork. Cover and cook for 5 minutes. Turn heat off, keep covered. 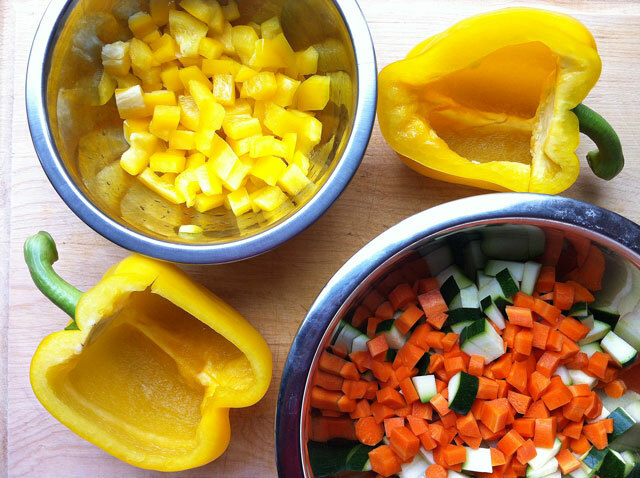 Cut peppers in half, or cut the top off, whichever you like better. Dice the scraps for salads or put in the quinoa. I did in half and scraps for salad. Get your grill hot, oil the grates lightly with an oiled towel or paper towel. Grab your tongs, and peppers, head outside! 2. Place the peppers open side down over medium flame, leave for about 5 minutes. Turn over and leave for another 5 minutes. Peppers done! 1. 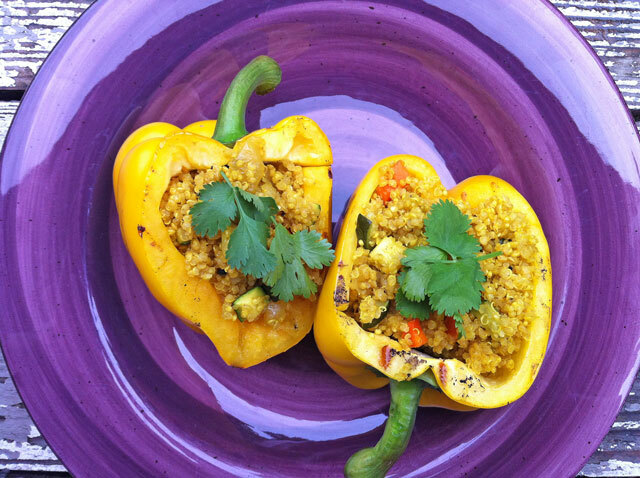 Stuff peppers with quinoa and garnish with fresh cilantro or parsley. Cool! Let me know how it goes!! !